Product-by-product, Google is completing their larger redesign that coincides with the new Google+ look. This morning there was a notification on my Gmail sign-in page that the change was coming and a link to try out the new page. Falling in line with the other redesigns Google has done recently, the new page has the flat buttons and slightly muted color palette. 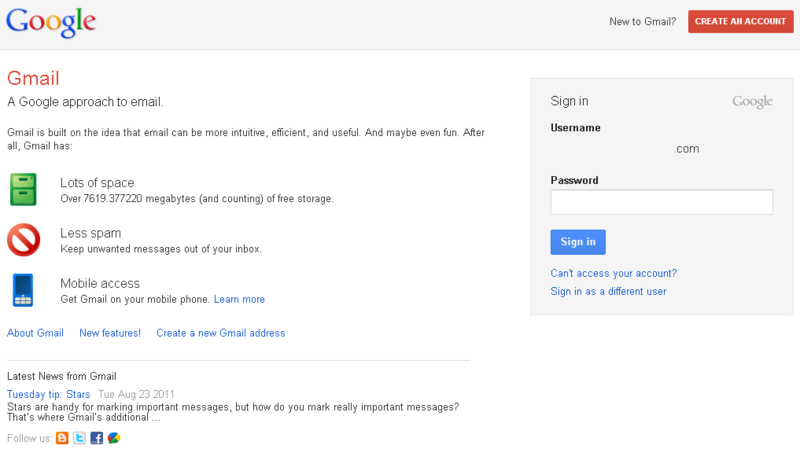 Gmail, YouTube, and Google Docs should all be getting the redesigned sign-in pages with this roll-out. Below are some frequently asked questions about the visual changes to Google sign-in pages. 1. How can I tell if I’m on the actual Google sign-in page? The Google sign-in page is a secure page, and you should see a lock icon in the address bar before the URL. You can also check the URL of the page, and make sure it says either www.google.com/accounts or accounts.google.com. If you’re still not sure whether you’re on the actual sign-in page, just type https://www.google.com/accounts directly into your address bar, and sign in from there. I don’t see any difference. Where can I get the new sign-in page? At the bottom of your sign-in page, you might see the option to preview our new look. Once you click the link, the new sign-in page will become your default sign in page across all Google products that currently have the new design enabled. For a limited time, you’ll be able to switch back to the old look by clicking a link at the bottom. 2. Why am I seeing different sign-in pages for different products? Since we’re still in the process of making changes, not all products will immediately use the new sign-in page. 3. Why do I sometimes see the old sign-in pages? Even if you’ve already seen the new sign-in page, the old one might come up again if you switch browsers, use a different Internet Protocol (IP) address, or sign in to a Google product that hasn’t started using the new sign-in page. 4. Will my bookmarks for Google sign-in pages still work? Yes, your bookmarks should still work at the same URL as before. None of the design changes should affect any of the personalized settings you’ve made to your Google Account or to your browser. 5. I don’t like the new design, can I switch back? For a limited time, you can switch back to the old version of the sign-in page by clicking the link at the bottom of the page. However, eventually this change will be permanent and you will not be able to switch to the old look. 6. Where can I report problems or feedback regarding the new design? To send us your comments on the new design, you can fill out our feedback form. Right now, the changes are purely cosmetic. Products work the same and it doesn’t touch the ranking of search results.